Mumbai, March 23 (IANS) The irrepressible Shatrughan Sinha may have lost the BJP's nomination from the Patna Sahib Lok Sabha seat to Union Minister Ravi Shankar Prasad. But is he sulking about it? Far from it! The actor-turned-politician says the move was long due. "The only reason why I stayed on at the BJP in spite of repeated snubs is because of my loyalty. I had vowed I'd not move until I was told to. The time to make the move is now." 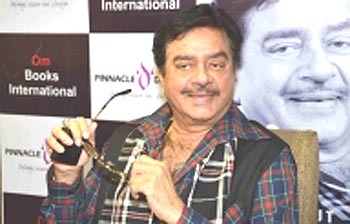 And Shatruji says he's very happy to go. "Or perhaps, 'go' is not the right word. The situation may change. The BJP is fielding a dear friend of mine, Ravi Shankar Prasad in my place from my constituency. But I will be contesting elections from my constituency only. "Thanks to the love and support of the Bihar junta for years, I've always emerged victorious from there. Now we will know whom the public voted for the party or me. By the grace of God I will win again from Patna. You can take away my seat. But you can't take away the love of my people from me. "Having said that I must say, I have no ill-will towards Ravi Shankar Prasad. He is an old friend. And I wish him all the best. May the best man win." While bidding adieu to the Bhartiya Janata Party, Shatruji lets out how he has suffered in silence as the party high command disrespected senior leaders. "Look at how they behaved with the very respected Mr Yashwant Sinha. Virtually pushed him out of the party. And now L.K. Advaniji who was sidelined for years has retired from elections at the same time when I've finally moved out of the BJP. "The party could have shown some grace towards the great leader by offering a ticket for his electoral constituency to Advaniji's daughter Pratibha or son Jayant. But of course that's too much to expect." At the moment, Shatruji refuses to divulge the political party he is joining. But whispers suggest he's been chosen by the Congress. "Let the heat and dust settle down. In a few days you will know. At the moment I want to thank all the leaders of the opposition... Mamta Bannerjee, Arvind Kejriwal and my family friend Lalu Yadav for standing by me."